The death toll from the building fire in an old part of Bangladesh capital Dhaka has risen to 69 with scores others injured, fire service officials said on Thursday. "We have so far recovered the bodies of 69 people," Mahfuz Riven, a duty officer of the Fire Service and Civil Defence, was quoted as saying by Xinhua news agency. The fire broke out around 10:00 p.m. at a chemical warehouse in old Dhaka. The death toll in the fire could rise, warned the fire officials, who have been working throughout the night to douse the devastating fire. Numerous people, including women and children, were also injured and admitted to nearby hospitals. 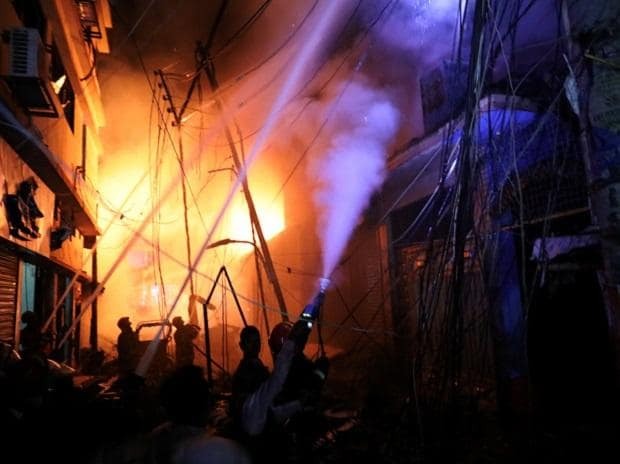 Bangladesh's fire service chief Ali Ahmed told AFP that the blaze at Chawkbazar in the old part of Dhaka might have originated from a gas cylinder before quickly spreading through the building where highly flammable chemicals were stored. The flames raced through four adjoining buildings, which were also used as chemical warehouses, including for storing plastic granules and body sprays. "There was a traffic jam when the fire broke out. So people could not escape," he said, describing a part of town where the streets are very narrow. Another fire official told reporters that the blaze, which began around 10.40pm (16:40 GMT) on Wednesday, has been "confined" but not yet doused despite the efforts of more than 200 firefighters. A police inspector at the Dhaka Medical College Hospital said at least 45 people were injured, including four people whose conditions were very critical.